So what's the big advantage running the 8* chubs and knuckles. It seems to me that you have less tire surface on the ground since they are on angle. What's your opinion? *It is a design to allow you to correct your pinion angle without effecting you caster and camber in your steering. In 1:1 terms it is what as known as called Cut and Turn. * 0 Ackerman allows you to have basically override steering. The point is to allow you to more than 45* of steering with both wheels. The point is for you to have hook and grab to your inside tire while you have over ride with your outside tire. Works best on upward inclines and downward declines where turning is needed on a sharp corner without buckling over on your wheels. A link would be great, but.....most of the degreed C-hibs are kingpin angle (AKA caster), NOT camber. Thus the tire tread is flat, but the steeper kingpin can help the tires clear links & shocks as well as allow clocking the axle. 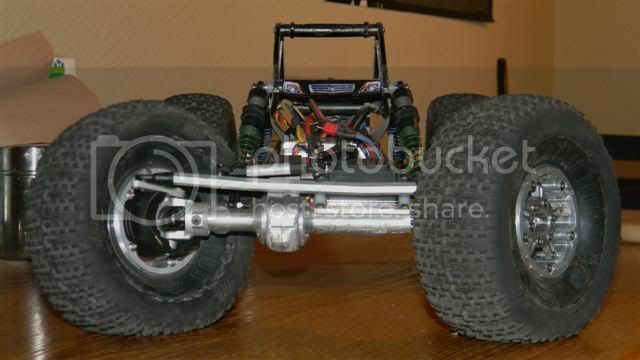 I'm trying to figure out if it is worth purchasing both front and rear berg axles from dlux and then purchase the vp 8* chubs and knuckles and also purchase the axial stubouts, or just get the rear axle to cut some weight and run my current setup with vp high steer knuckles that I already have on it. Is the 8* worth an extra $150.00. My other goal is to cut weight, but I really don't need weight cut out on my front tubes, that's were you want some weight is up front and low. Let me know what you guys think! I liked the switch from standard berg steering to the 8 degree and zero ackerman setup. At first, I couldn't see spending the extra money either. That berg "push" is gone. Steering is more consistent overall. If/when you go with knuckle weights and 8 degree setup, you'll still probably want to run some weight in the wheels, to keep some rotational mass. And the main things for new axle tubes is axle clearance. Cause you can get too light out back with new smaller diameter tubes and have to add weight back on the axle or wheels. It's kingpin inclination. It has nothing to do with static caster/camber. IMO, not that big of a deal. 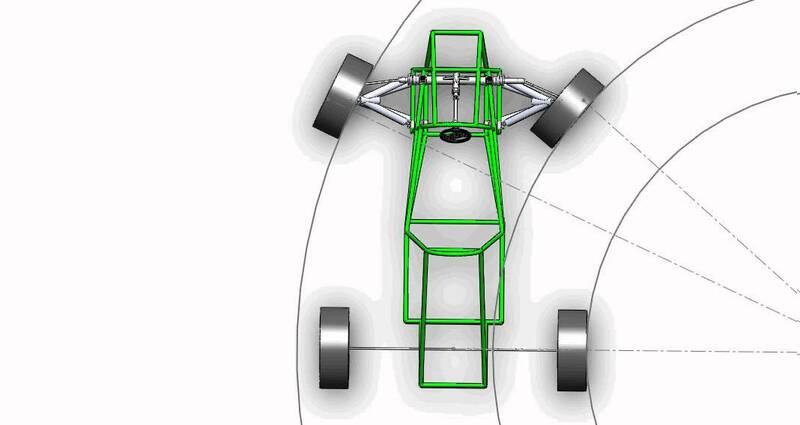 On most modern designs, the kingpin is set at an angle relative to the true vertical line, as viewed from the front or back of the vehicle. This is the kingpin inclination or KPI (also called steering axis inclination, or SAI). This has an important effect on the steering, making it tend to return to the straight ahead or centre position. This is because the straight ahead position is where the wheel is at its highest point relative to the suspended body of the vehicle - the weight of the vehicle tends to turn the kingpin to this position. A second effect of the kingpin inclination is to set the scrub radius of the steered wheel. This is the offset between the tyre's contact point with the road surface and the projected axis of the steering down through the kingpin. If these points coincide, the scrub radius is zero. Zero scrub radius is possible without an inclined kingpin, but requires a deeply dished wheel so that the kingpin is at the centerline of the wheel. It's much more practical to incline the kingpin and use a less dished wheel, which also gives the self-centering effect. Zero scrub radius is not necessarily desirable - larger scrub radii lead to less steering effort (especially on vehicles without power steering) but more force applied to the steering components by road surface imperfections, braking, etc. Zero scrub radius isolates the steering from these effects but can lead to a "dead" feel for the driver which is undesirable, especially on performance vehicles. So will the Standerd non 8* ax10 chubs fit my vp berg high steer knuckles with berg stubouts. I think for now I would like to get the dlux berg kit front and rear, so I can adjust my caster without affecting my motor or link and shock mounts. But I think I will save my money and not run 8* for now. I can use that money to help my patheticly slow losi! X2. That's about as simple as it can be explained without leading to a whole book on steering design. Is it good, sure. Is it necessary for crawlers, not really. Yes, standard ax10 c-hubs will work with vp berg knuckles. I have been wanting to post up about this myself to see if I can get some insight. I bought some 8* stuff for my car but I have never installed them. Most of the time when I go out and bash I am with an XR10 that has the 8* setup. We have very similar setups and we have both noticed a lot of instances where we thought the 8* setup may be hurting instead of helping. After reading Nabil's post about why he thinks the 8* setup needs knuckle weight (building the ultimate xr10), it really started clicking for me. Here is a picture that shows exactly what Nabil is talking about. If you look at my axle you can see the angle that the non 8* puts it on. All of that pressure is going to the outside tire. A link would be great, but.....most of the degreed C-hibs are kingpin angle (AKA caster), NOT camber. Both replies have nothing to do with 8* knuckles and chubs. My other goal is to cut weight, but I really don't need weight cut out on my front tubes, that's were you want some weight is up front and low. Maybe another thread would need to be started on the subject but I just dont understand why people dont want all their weight out at the wheels? If you needed more weight in your car you would never add weight to the axles, you would add it at the wheels. 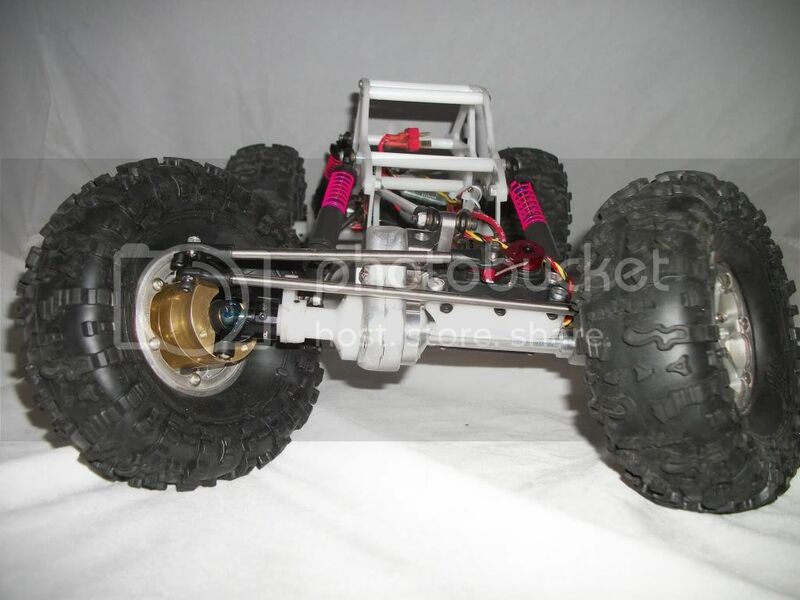 So, why not take an ounce out of your axles and put it at the wheels? To me, its like going to a teeter toter contest and your competitor weighs 5lb more than you. Youre going to be leaning back, hanging on with your feet or doing whatever you can to try and get an advantage on him by LEANING FURTHER OUTWARDS. Surely your not going to sit in the middle on the pivot. Last edited by Erik D_lux; 12-11-2011 at 11:34 AM. I wanted to see both sides of this positives and negatives, and this has really given me a good idea of what I need for my driving style. For me the truck drives better without having the axle angle down towards the outer tire with the 8* setup. With all of the options we have now (caster, kingpin inclination, knuckle weights and a choice of fackerman or zero ackerman) I believe that they all have to work together in moderation to get the best result. With that said, the inner tire on a 8* setup gets more traction than the outer. It lays out thus creating a better contact patch. It also turns a little farther since it is zero ackerman. That is why we are having success with digging up hill. So if you have a truck with a ton of caster the axle will lean towards the outer tire. With a 8* setup that won't work well when the inside tire is doing most of the work, especially when digging up hill. I didnt know if you were talking 8*, non or both. Makes sense why you would like less caster (with 8*) and why I like more (non 8*). It also seems that 8* would take away from two mods that I really, really like. Lots of caster to help with digging and grabbing ledges on climbs and also allegedly making knuckle weights less effective. The 8* advantage is merely for scrub on a straight axle... Although when you start spacing the wheel further and further out to add knuckle weights you are negating the advantage. I thought U didn't like 8 deg C-hubs so why on this build ???? So, the whole reason 8* exists is because you need it on say a street driven rig. Why? Well because 8* will take pressure off the outside tire. If you ran 0* on your Prius, when you turn, your car would want to flip over from getting too much traction on the outside tire. By running 8*, it makes the front tires sit much more neutral during turns. Another thing, when you have more pressure on that outside tire, your car is going to want to push. You really dont want that outside tire to do any work. You want your inside tire to do all the work. You want that inside tire to turn sharper than the outside and also to have as much of the pressure as possible. This is why ideally you want 0 ackerman and maybe a little toe out. The problem with 8* is that it takes all the pressure off that outside tire (but I just said it helps, right?). 0* can be a HUGE tool to use in many situations and IMO, 0* helps much, much more than it hurts, WHEN CRAWLING. So, after saying all that contradictory stuff, I chose 8* right now because it turns on flat ground much better than 0* (allegedly). Since sporties are much more about lining up for a gate or being able to get from gate to gate without taking reverse penalties I feel that turning is much more important than capability, if that makes sense? This is also why I have a problem getting interested in sporties. When lining up for a gate is more important than the over all capability of a car making it thru a gate, that just does not make sense in my head. Damn Erik rising the thread from the dead. True but I actually understand it now. That explanation was worth the necro.